If you're looking for a break from the busyness of city life, you're in luck! There are several state parks near Charlotte that offer a chance to get away for hiking, fishing, or a picnic if you're looking to relax, or rock climbing and bouldering if you're looking for adventure. All of these parks make for a great day trip from Charlotte - they're all 2 hours away or less. These are also excellent spots if you're looking for a nice camping destination close by, While each one has essentially the same attraction (hiking or biking trails, camping, and water), they're all worlds apart. Find out a little more about each park, and click on each one for more details. Each distance is calculated from the center of Charlotte. Crowders Mountain is the closest state park to Charlotte, and on weekends you'll find the park packed with Charlotteans escaping city life. The landscape here offers a variety of terrain. You'll find miles of trails that wind through spectacular surroundings, with some trails linking all the way to Kings Mountain State Park and Kings Mountain National Military Park in South Carolina. It's a fantastic place for beginner or expert hikers. Crowders is famous for the Backside Trail, a trail that leads to the mountain's pinnacle, but not before climbers have to tackle 336 wooden steps near the peak. The rock climbing opportunities here draw people from Gaston, Mecklenburg and Lincoln counties and beyond. On a clear day, you can see actually see the Charlotte skyline from the peak. There's paddling and fishing available on Crowders Mountain Lake, with canoes for rent at the park office (but fishers must be at least 16 and have a NC fishing license). For experienced climbers, Crowders allows bouldering and rock climbing in certain areas. Two large picnic shelters are available, both of which are on a first come, first serve basis unless a reservation is requested. For smaller gatherings, 10 picnic tables are scattered through the park with a grill at each one. The main attraction at Lake Norman State Park is, of course, the largest man-made lake in the state, Lake Norman. But there are plenty of hiking and biking trails, as well as room to camp. There are 30 miles of single track trail with a 125 yard swim beach a favorite of many visitors. Like other parks, there's a fee to swim when lifeguards are present. There's a small concession stand that sells drinks, snacks, and ice cream. Changing rooms, showers, and lockers are available for use, with the beach open from 10 a.m. to 5:30 p.m. April to October. Kayaks, canoes, pedal boats, and paddle boards are all available for rent on site. Fishing for crappie and bluegill is a popular sport, and you'll find plenty of picnic tables situated along the lake. The picnic shelters at Lake Norman are very popular, so reservations are strongly suggested. Fishing and boating are the most popular activities at Morrow Mountain, but there's plenty of recreation to go around. 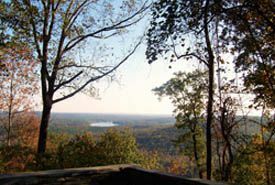 There are miles of hiking trails to cover on foot or on horseback, and cabins and camping are available. You'll actually find more miles of horseback riding trails here than hiking trails. A boat ramp at the end of the park's main road is available for launching your own boat, or rowboats can be rented from the park's boathouse. Boat rentals are only available weekends in April, May, September and October, and June through Labor Day. Lake Tillery can be fished form the pier, from the banks, or from a boat with a NC license. The lake holds mostly bass (largemouth and striped), plus perch, catfish, and crappie. Due to dangerous currents, swimming in the lake isn't allowed. Morrow Mountain park also offers swimming in a swimming pool, also open June through Labor Day. There's a restroom, changing room, and showers available, plus a place to purchase snacks and cold drinks. There is a small entrance fee charged for the pool. A four table picnic shelter is available with gorgeous views of Lake Tillery and the Uwharrie Mountains, and a six table shelter is available close to the park's pool. South Mountains State Park is deep in the woods, and a perfect place to escape from city life. It's one of the most rugged state parks in the area, with elevations that climb to around 3,000 feet. The park includes 40 miles of hiking trails and an 80 foot waterfall. There's a 17 mile mountain biking loop at South Mountains Park, but this is considered to be a very strenuous trek. It's not recommended for beginners. There are also several drive-to camping sites if you're trying to camp without the hike. 33 miles of equestrian trails can be found at the park, and they're open to anyone who has documentation of a negative equine infectious anemia test. There's no lake at South Mountains, but there are several streams that are classified as delayed harvest trout water. As with other locations, you will need a fishing license to legally fish. Lake James is a 6,800 acre reservoir with over 150 miles of shoreline, so it's not hard to find quiet here. You'll get beautiful views of the Appalachian Mountain range as you swim, sunbathe, or enjoy a picnic on the shore. You'll have options for boating, water skiing and fishing, or just relaxing with a walk around the lake or through forests nearby. One unique part of Lake James State Park is the remote camping spots that can only be reached by paddle. Waterfront campsites are available just a 200 yard walk from parking spots. Canoes and kayaks are available for rent at various times throughout the year. Another unique offering here is swimming in the Paddy's Creek area. There is a small fee for swimming when life quards are present, and free when they're not there. Swimming is only allowed in the lined off areas. Thanks to hydroelectric power production, fishing here can be challenging. Water levels change often, and fish can range from very densely concentrated to sparse. There is water that runs as deep at 120 feet, and plenty of coves to explore. Largemouth bass is the prize here, and Walleye are also very highly sought after. Make sure you do have a fishing license before you set out to take home a trophy though. There are three large picnic areas here, with ones overlooking the Catawba River and Paddy's Creek. Drinking water is available just a short walk from all picnic and camping sites. This is where you'll find some of the best mountain scenery of any North Carolina state park. Chimney Rock gets its name from the over 300-foot spire that stands on the southern side of the park. A small stairway was built to the summit in 1885, and it's been a tourist destination ever since. There was an elevator to the summit, but it's actually been out of service since fall of 2015, and will remain down until repairs can be made. There are plenty of hiking trails nearby. The Rocky Broad River is a dream for licensed fishers, with trout being the main goal. Fishing waters can be accessed from the park's front gate. There is an admission fee to the park, and it's charged at the main gate. Picnic tables and grills are available at several spots throughout the park. Chimney Rock is unique in that is has two gift shops and a restaurant on site. Gift shops are placed at the top of the park for people to bring back souvenirs from the trip to the top. These shops have clothing, books, decorative items and more. One shop is at the bottom of the elevator, with another at the top. The Old Rock Café is open year round, and serves ip traditional favorites to hungry visitors with patio dining by the river. Rock climbing is available at Rumbling Bald Mountain, but it's not recommended for beginners. A registration and permit is required. Weymouth Woods is a 900-acre natural preserve that's a little different than most parks. The main focus of the preserve is the longleaf pine forest and the plants and animals that are a part of it. There's a museum that's open daily. There are plenty of hiking trails and even a guided tour.